Movies at the Motherhouse will begin again in January. We will provide these evenings of relaxation and fun with some of the popular movies of our time. All movie nights are free of charge. Refreshments are served. MARK YOUR CALENDARS! FEE: Free will offering. Registration requested. Join pastoral minister, singer/songwriter and author Bill Tonnis for a night of Lenten reflection on the many “dyings” and “risings” of our lives. Bill will speak about the impact of Thomas Merton on his journey to finding his true self. He will share several songs from his four albums of original music. TIME: 6:30-8:30 Payable at time of registration. Come and enjoy timeless rhythms of self-expression from the core of your being – no experience or formal training needed - just your heart-beat. In the Drum Circle, there is no audience. Everyone is part of the echoing sound that comes from their within. Spend one hour with your heart beat and find the rhythm of your soul. Drums are provided. Fee: No fee; registration requested. As we move along our journey of life, along our “pathways,” we discover different ways in which we meet God. We invite you to come explore and pray as we connect with God in a variety of new ways. St. James, in his epistle in the New Testament, states that "faith without good works is dead." Victorian women, while assigned traditional gender roles in both society and church, often translated their prayer life into those good works of which St. James spoke. Come and meet some of these remarkable women and learn how to balance faith and good works in our own busy lives. Judi Sauerbrey is a retired teacher, having spent 49 years as a high school and college instructor in English and the Humanities. She is Director Emerita of Women’s Studies at Mount St. Joseph University, an avid quilter and an Associate of the Sisters of Charity of Cincinnati. Linda Bonnell is former curator and director of educational programs at Hillforest Victorian House Museum in Aurora, Indiana. She has an extensive background in women's studies with a specialty in the Victorian era. She has also been a Civil War reanactor and has presented many educational programs in the greater Cincinnati area. TIME: 10 a.m. -12:00 p.m.
Fee due at time of registration. S. Jackie Kowalski, SC has been creating pottery for 25 years; throwing bowls and mugs, hand building and designing wall art. Besides her years of experience, she brings a passion for clay as a medium of self-expression and a way to interact with God. Nature is one of the most fulfilling gifts we have in our lives. Praying and sharing nature experiences with others is so gratifying. This year we will be celebrating the turning of the seasons with the gifts of nature that Marty has captured with her camera. We are graced by the creatures of our planet, our brothers and sisters, as we enjoy our world, day by day. 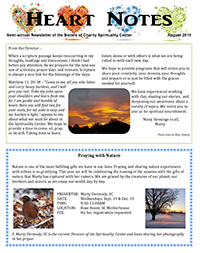 S. Marty Dermody, SC is the current Director of the Spirituality Center and loves sharing her photography in her prayer. Come and share some time to appreciate the qualities and gifts you hold within yourself. Our God gives all and no one is just like you. This workshop will be held on two consecutive Thursdays—you must be able to attend both sessions. Betty Finn, SC, is currently engaged in spiritual direction and retreat work. She has a background in counseling and a private practice of spiritual direction. Betty has previously been involved in community leadership, formation work, working with adult students at Mount St. Joseph University, and elementary education. She has been giving retreats, both directed and conference, for over 20 years. S. Blandina Segale, Servant of God, provides us a strong model of the ways to risk a caring response in our time. Whenever she saw a need, she found a way to respond, many times quite creatively. These point ways for us to respond like her, no matter what our age, wherever Providence places us. What does "Going Deeper Into the Divine Mystery" mean for us as individuals and as a congregation? We'll explore how God is drawing us into an adventure. Those who do not live at the Motherhouse are requested to call 347-5300 (daytime) or 347-5346 (evening) and leave a message if you plan to stay for dinner. If we are in touch with God’s great love for us, our hearts will be filled with song. This retreat will focus on some of the ways we can nourish our song and our Christian discipleship: through love of nature, prayer, friendship, compassion, service, playfulness, gratitude, letting go, laughter, art, courage during pain and sorrow, and hope. Using scripture, music, stories, poetry, and short videos we will hopefully deepen our relationship with a God who loves us more than we can imagine. Sr. Melannie’s bio - I have two wonderful ministries: I write for publication and I give talks and retreats all over the country. These two ministries are a perfect balance for me. The writing nourishes the “hermit” in me, that is, the Melannie who is naturally drawn to silence, solitude, and reflection. The giving of talks and retreats feeds the outgoing Melannie, the one who enjoys being with people and entering their lives on a deeper level. When I’m not writing or giving retreats, I can be found walking in a park or in our neighborhood, making tapioca or apple strudel, conversing with friends, listening to music, cheering for one of Cleveland’s sports teams, or strug-gling with a crossword puzzle: What is a seven letter word for lucky or fortunate? The answer is blessed! And that’s just how I feel! Retreats open at 4:00 p.m. on Sunday, August 4 and end with the noon meal on Saturday, August 10. * No fee required for Sisters living in the Motherhouse or Mother Margaret Hall. Donations welcome. CAROL BRENNER, SC is a spiritual director and retreat minister. She completed her Internship in Spiritual Direc-tion in Milford, Ohio in 1987 and has been companioning others on their spiritual journey since then. Her past ministry experience includes teaching, religious education, parish ministry, eleven years in St. Lucia and 16 years on the staff of the Spirituality Center. services director at the Immaculate Heart of Mary Motherhouse in Monroe, MI. Her deep love is spiritual direction and retreat ministry. Judith invites the person to name God’s invitation, to reverence and to respond to this mystery as it unfolds in one’s life experiences. includes spiritual direction, directing retreats and facilitating various spiritual programs. FR. JACK CONLEY, CP was born in Chicago, IL in 1949. He grew up in the Passionist Parish of the Immaculate Conception on the city’s northwest side. In 1976 Fr. Jack completed his theological studies at Catholic Theological Union in Chicago where he received a Master of Divinity Degree. He was ordained a priest after graduation. At the present time, besides continuing as an itinerant preacher, Fr. Jack serves as a member of the Provincial Council for Holy Cross Province. In that capacity he has conducted the formal, annual visitation to the Passionist Mission in India. If you feel called to a contemplative way of praying, and if you would like mutual, ongoing support and learning about it, a Centering Prayer group may be for you.